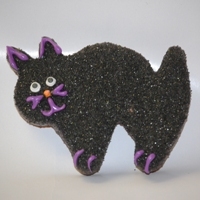 Our Black Cat is the perfect treat for Halloween! Our Simply Divine brownie base is smothered in dark chocolate, sprinkled with black sanding sugar and decorated with the spookiest of colors. Each cat is packaged in a cellophane bag and tied with a seasonal ribbon. Ingredients: Dark brown sugar, unsalted butter, fine chocolate (unsweetened and semisweet), eggs, enriched bleached flour, vanilla, kosher salt, baking powder, dark chocolate, black sanding sugar, assorted candy writers (sugar, palm kernel oil, cocoa, non-fat dry milk, dry whole milk, glyceryl lacto eaters of fatty acid, salt, artificial coloring), candy eyes.